1. 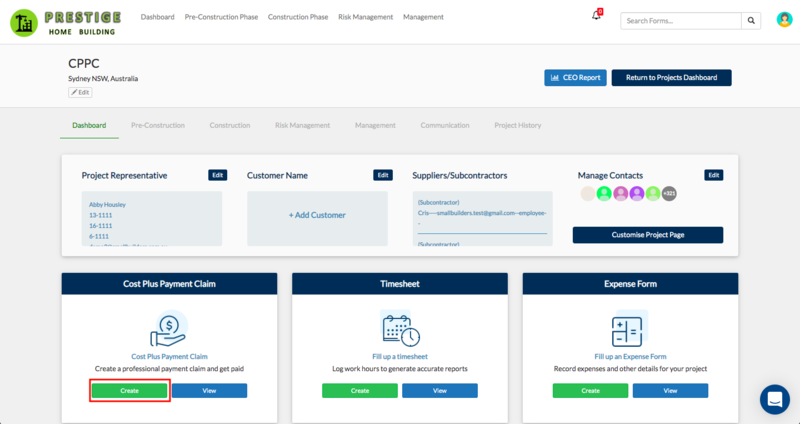 Click Create on the Cost Plus Payment Claim tile on the Project Page. 2. 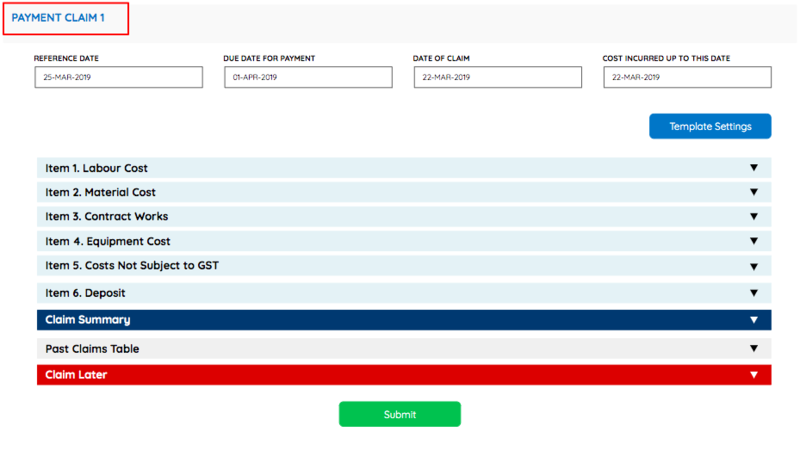 If you're done completing your project breakdown, then you will be directed to the Payment Claim Form. Otherwise, you will be directed to the Project Breakdown page. 3. There are 5 tabs on the Payment Claim Form for your expenses or costs. 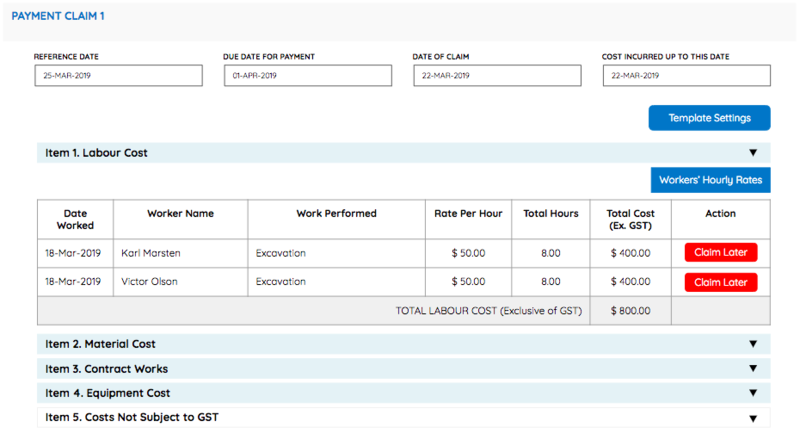 Note: If you did not submit Timesheets, Equipment Hires or Expenses prior to creating the Payment Claim, then no records will display on your claim tables. 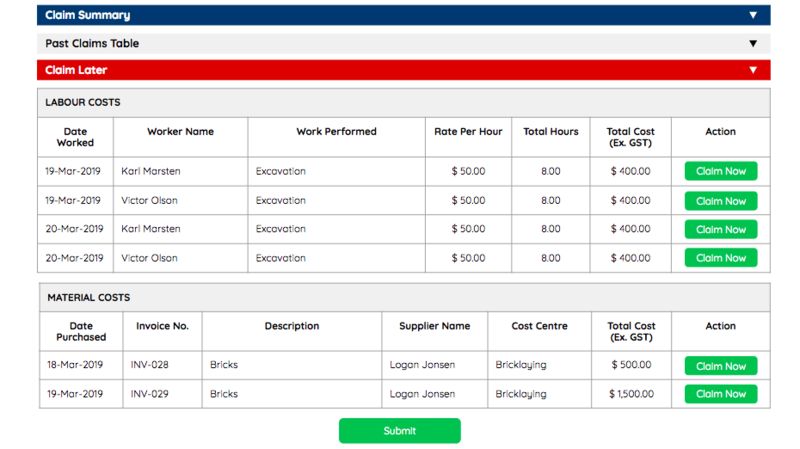 Note: You can have your expense submissions from your suppliers and contractors printed in one table by selecting Template 1 under the Template Settings button. Learn more about the template settings here. 4. All expenses you incur up to the current date is displayed on your Payment Claim form under the each tab. 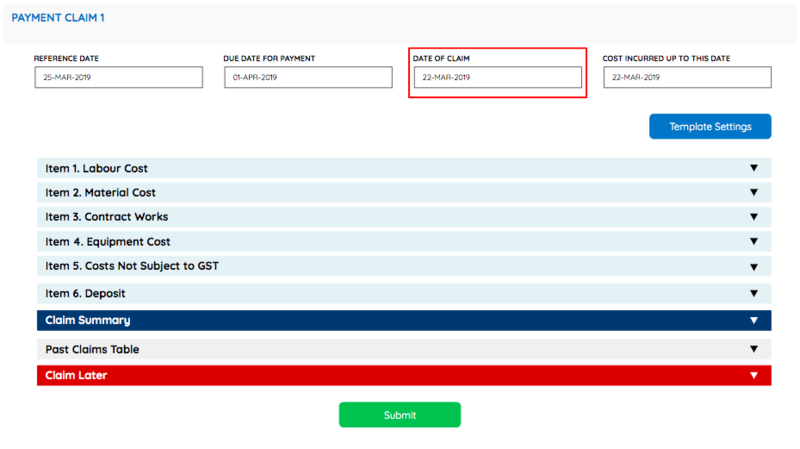 You can filter the results by changing the date on the COSTS INCURRED UP TO THIS DATE field. 5. The Payment Claim Number is automated. 6. 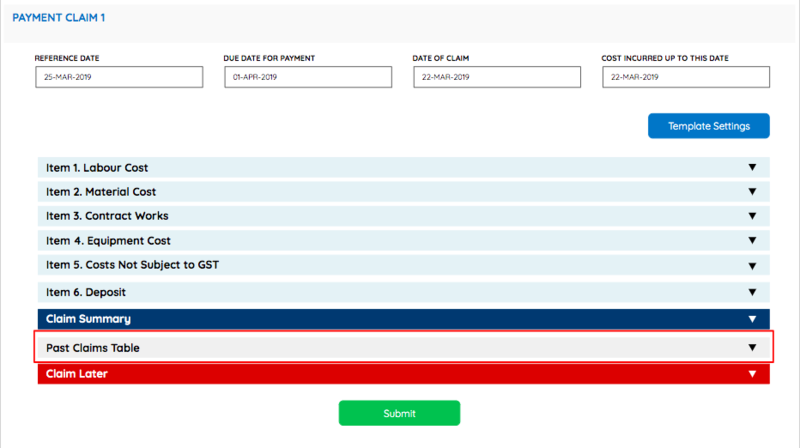 The Reference Date and Due Date are both defaulted to the Reference and Due Dates that you set up on your Project Breakdown. 7. 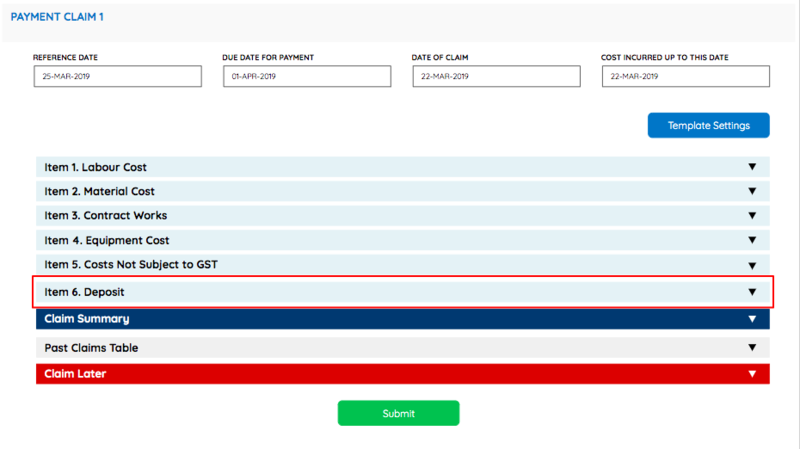 The Date of Claim is defaulted to the date you create the Payment Claim. To update it, click on the field then select a new date. 8. 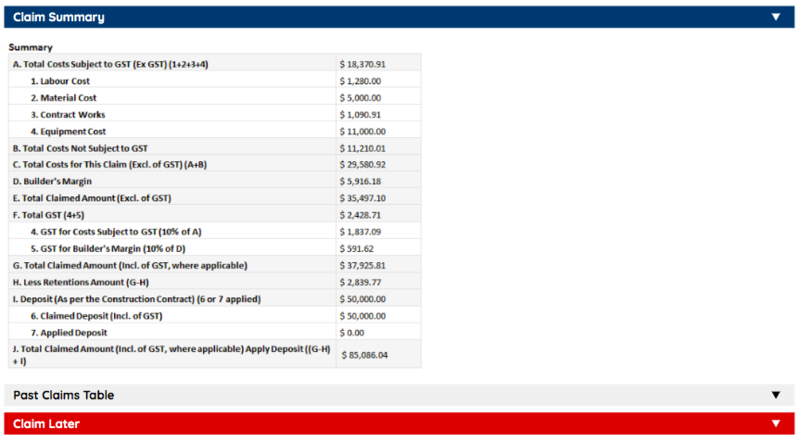 Click on the tabs to see your expenses in detail. Click the Claim Later button on the expenses that you do not want to claim yet. 9. You can see your expenses that are saved for claiming later under the Claim Later table. 10. Click the Claim Now button on the expense or cost that you want to include on your current claim again. 11. The Deposit fields are under the Deposit tab. You can claim for and apply deposits through the Deposit tab. 12. The breakdown of your Payment Claim is recorded under the Claim Summary tab. 13. You can view your previous claims under the Past Claims tab. 14. Hit the Submit button to save your Payment Claim.